We interviewed Beatrice Taylor, facilitator of our multicultural women’s sewing group, to find out what made her want to teach the course and what she learnt from its participants. What made you want to run these sessions? I believe everyone should have some basic sewing skills, and felt the women would appreciate and utilise what I could teach them. A lot of clothes that could be easily mended are discarded because people don’t have these basic skills. By running these sessions, I was hoping to help people save money and be creative. Along the way I learnt about people’s differing learning styles and needs. Everyone has their own pace. Also, hands-on demonstrations worked best as English is many people’s second language in this community – another barrier to learning which made me want to teach this class. Has it been gratifying to help the women develop skills and make such usable and beautiful items? Running this course has been one of my most rewarding experiences. Helping women to feel empowered and confident in themselves and their creative and practical skills was a real joy. The course also created a wonderful community where women could come together to learn something new and have fun. It was an amazing feeling when women from the course with no sewing skills went home to practice and made beautiful clothes for themselves and their children. 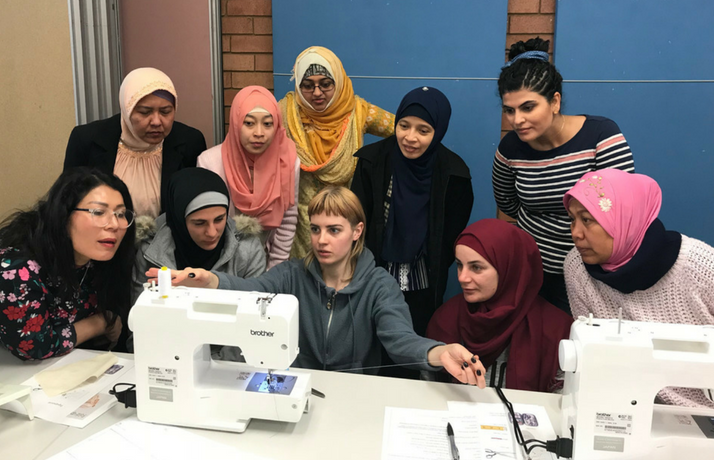 – Advance Diversity Services’ multicultural women’s sewing group ran from August to October 2018.